This post was inspired by amusing emails I received. But be warned: unless you are now or have ever been an orchestra musician you're probably not going to get it. Several weeks ago, we sent you a list of translations of the German markings in the Mahler. We now realize that this list contained many serious errors. These sheets contain the correct versions. So we don't waste valuable rehearsal time on this, copy these corrections into your part immediately. Want to know what the German really means? Copy a phrase and click here. Click on the picture to see all the spiffy little details. Fairie's Aire and other similar notational nightmares (some of them intended seriously by the most important and impressive of important, impressive composers) may be found here, at a blog called Dark Roasted Blend. I probably created this in the eighties when my work was still done with cheap, reliable pens, ink and straightedges instead of with expensive, bug-ridden computers. Judy Green, proprietor of Judy Green Music, had changed vellum suppliers (that's the translucent paper onto which music was copied). She wanted me to test the new paper. 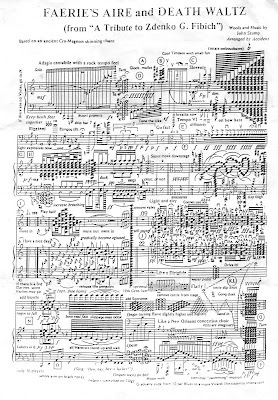 So I sat down one day with the sample sheet of vellum and proceeded to write this, er, piece of music. There's no real title so I'm calling it by the first tempo indication Moderato non troppo ("not too moderately"). 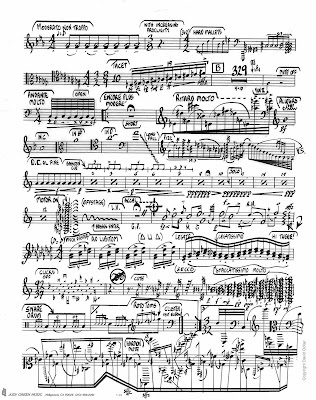 My principal consideration as a composer was whether the paper held the ink well. I wanted to know if it would smear and other similar musical things. (As always, click the pic for enlargement.) Notice Judy's logo and address in the lower left. The original of Moderato non troppo hangs in my office to this day - attached to the side of a bookcase with a piece of scotch tape. Has anyone ever heard of the Doctor Schmutzig Method for Holzblasinstrumente? I remember a small, comedic musical-instruction pamphlet which I probably saw in college. The woodwind instrument it teaches looked suspiciously like a vacuum cleaner. I cannot find any reference to this online. It's possible that I remember it imprecisely. Once, after I mentioned the pamphlet to Leslie, she started calling me "Doctor Schmutzig". Not because I know how to play a vacuum cleaner but because I'm so good at making a mess. I'd like to reacquaint myself with this little "gem". And I'd like to prove to her that I didn't just make it up. (Maybe I did.) Any help in this quest will be gratefully received. Read Mixed Meters' rant about Mahler Me and Mahler, Me and Iowa. Notations 21 is a website which has many examples of "innovative notations". Thanks to David Avshalomov and John Steinmetz for sending the inspirational emails. I'm so happy you are a Schumtzig fan! I made a post about the woodwind method a while back. Unfortunately the link to buy the music no longer works, so a library copy is your best bet. Thank you, Elaine. Thank you. I was searching for "Doctor Schmutzig" but his proper title is "Professor" "Professor Schmutzig" only gets 11 hits on Google. Thank you on behalf of Leslie as well. My booklet arrived last week. My memory of it was more amusing than the thing itself. Or maybe I'm just more of a sophisticate now.